Classically trained pianist and composer Dulce Joya began her musical studies at the age of six at an arts school in her native Cuba. Having studied, performed and taught music in Colombia, Austria and her current home of Germany, she creates solo piano vistas that blur the boundaries between reality and fantasy. Weaving elements of classical, progressive rock and theater music into the twelve compositions that comprise her glowing debut album, Reality of Dreams is a potent manifestation of this versatile composer’s ability to write musical poetry inspired by philosophical musings and novel-like romance. “Romantic Power” is a dynamic opener that immediately showcases Dulce Joya’s boldly intricate piano-playing, as she effortlessly moves through the registers. Like with most of her other pieces on this album, she places much emphasis in the lower keys, which notably contributes to the overall richness and solemnity of her compositions. The next piece, “Call of the King”, feels appropriately regal and processional-like while displaying a renaissance flair. The composer then smoothly connects the middle bridge with a fluttering figure on the keys before eventually reverting to a more pronounced motif. One of my favorite pieces the album is “Shadows of my Soul”, a contemplative number that passes through several tonal phases, while its neatly stringed-together fragments perhaps mirror the many aspects and complexities of one’s psyche. I’m also particularly fond of the aptly-titled “Winter Dreams”, a more spacious and slower-placed number which indeed exudes both wintry and dreamlike quality. “Fallen Angel” precedes the album’s final piece at a lengthy 8:13 minutes with a notably classical and complex arrangement. A wholly immersive musical suite, the melody cascades with a powerful force like majestic river rapids, eventually subsiding towards the end into a delicate stream. And finally, the heartfelt “Goodbye” is perhaps not as wistful as its title may suggest, but rather exudes an air of optimistic solace. 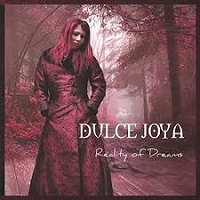 Impressively cinematic and theatrical in her approach, Dulce Joya is simply a natural at musical narration, her compositions striking a perfect balance between vivid expression and subtle inflection at all the right moments. An artistically mature debut from a top-notch composer, Reality of Dreams is chock-full of sweepingly beautiful passages. It will especially appeal to listeners who appreciate neoclassical piano that's tastefully ornamented with a passionately epic pizzazz!